The very first Ravnica block introduced us a new world, featuring a whole slew of mechanics, cards, and, of course, guilds. 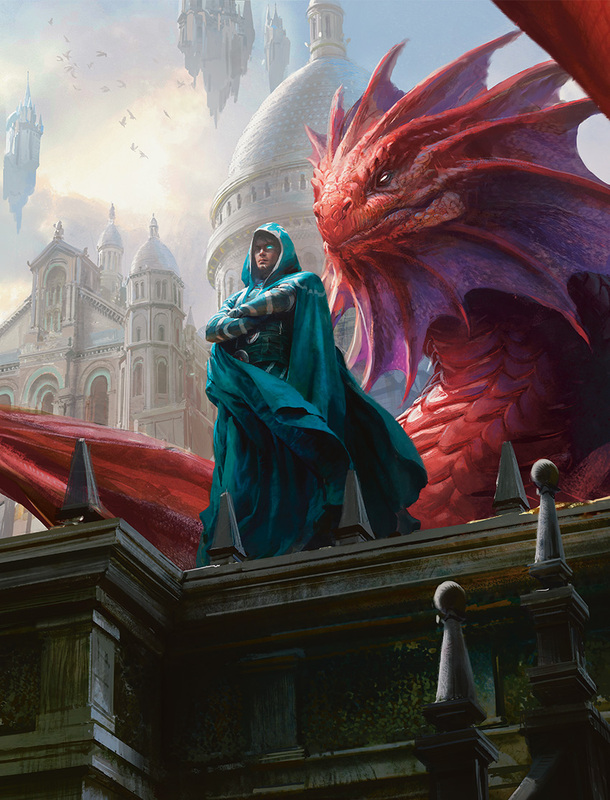 The guilds were more compelling than any faction Magic had ever made up to that point, and players latched onto these identities—and the legendary characters that embodied them. Some worked better than others. (Sorry, Agrus Kos.) But perhaps the one that people latched onto the most should have been no surprise. After all, would you rather hang with an old bureaucrat, an investigator, or . . . a genius Dragon? Everything about this card was wonderful. The artwork. The exciting mechanics. The goofy in-joke flavor text. How it went infinite with Ophidian Eye. You can tell a card is super popular if people are slipping it into decks when it isn't really strong enough for the format—and there were plenty of people trying to make Niv happen. When the Commander format took off, Niv-Mizzet was a very popular early commander. He was a beloved character. And for many, Niv-Mizzet was the symbol of Ravnica. So when we went back, we even put him into the first-ever image we showed people, what we call the "key art" for the set. When we last saw Niv-Mizzet, he wasn't doing so hot. Bolas had struck him down; after all, there's only room for one hyperintelligent dragon on Ravnica. But there's a funny thing about hyperintelligent dragons: they're usually pretty good about thinking ahead and preparing for every eventuality. 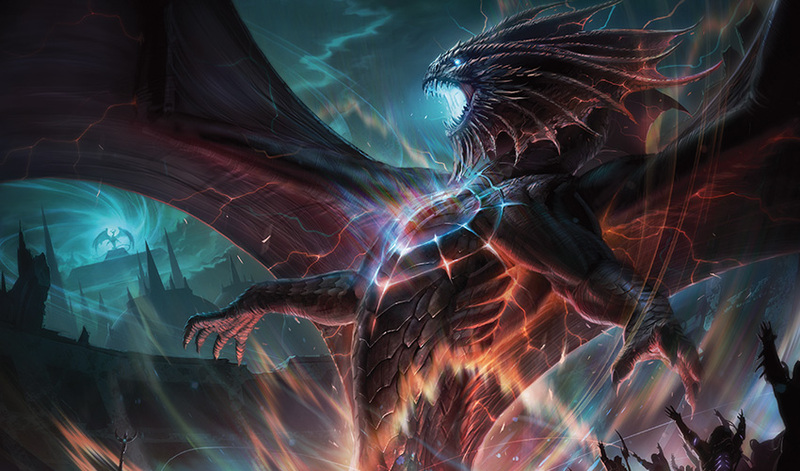 Niv-Mizzet had laid out the clues for others to build him back. Bigger. Better. Stronger. Where do you go after mana costs of 2UURR, 2UURR, and UUURRR? Well, you transcend to the next level. Take a look, my friends, at Niv-Mizzet Reborn! Wow. You haven't seen anything quite like this before! This is a pretty wild design, so I want to take a look at a few different pieces of it today. Remember all those Izzet experiments and projects? Well, this is what Niv-Mizzet was laying the groundwork for. A project that could rebuild him and bring him back in the case of an emergency. I'll let our fine Creative folks get more into that elsewhere. But from a design perspective, we knew we needed to make a five-color Niv-Mizzet. It should be something different—a five color card in a Ravnica set is a true oddity—and yet something that lived up the Niv-Mizzet name. We went through a number of versions, none of which really felt quite right for the majesty of a five-color Niv-Mizzet. How do you make a five-color card that is still about the guilds? It was Ken Nagle who cracked the case with something new: "guilds matter." Sure, we had made plenty of cards themed around guilds before. We had plenty of creatively themed cards around the guilds. Even some cards that rewarded multicolor. But cards that actually cared about the two-color guilds themselves? That was something new! And so, a Niv-Mizzet was born. Other than some wording changes (Ken's original pitch pushed templating limits a bit by actually calling out the guilds on the card), this idea stuck all the way through Set Design. It's something truly unique that asks a fun deck-building riddle, feels like Niv-Mizzet by drawing you cards, and definitely cares about the guilds. So, how do you build with this? Let's talk about a couple different areas. Is the mana in Standard good enough to support Niv? Yes—you just have to work at it a little. Between the Ravnica shock lands, the Ixalan buddy lands, and some other fixing, there's plenty to get you your colors. The Lantern makes all your dreams come true with ease. You can cast Niv-Mizzet and all the gold cards you draw with him! It even curves perfectly: turn three Lantern, turn four Niv-Mizzet. Bam! While of course we all have big dreams of drawing ten cards with Niv-Mizzet Reborn, it doesn't take finding a lot to make the Dragon plenty potent. Even if you just take your selection of two cards from a pile of ten, you've still summoned a 6/6 card-selecting Mulldrifter! One final thing to think about: there are a few ways to be sneaky with Niv-Mizzet as well. For example, the split cards throughout Guilds of Ravnica and Ravnica Allegiance. Because one half of them can be played with hybrid mana, it gives you something that isn't a dead card early if you haven't found your colors while still counting as a multicolored card later for Niv-Mizzet Reborn. For example, if you are base blue-red-white control, playing Discovery // Dispersal gives you a card you can cast early on. But then once you get WUBRG online, whether by Lantern or otherwise, the card can be put into your hand by Niv-Mizzet. It's easy to find ways to sneak some extra kinds of gold cards into your deck this way! I can't wait to hear about the first person who draws ten off Niv-Mizzet in a Standard tournament. Let's see those pictures! Five-color Commander decks have been popular since the beginning. Cromat, Horde of Notions, and more have pioneered the way. But there aren't that many five-color commanders that really care about multicolor. After all, if you are playing five colors, it's in part so you can fill your deck with powerful gold cards! 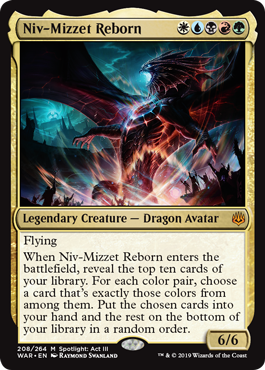 Niv-Mizzet Reborn addresses this in spades. You can make a deck full of two-color cards from the history of the game. I predict this will be pretty popular. Plus, there's a pretty fun Ravnica-themed deck to be made here too! I am sure I'll be staring down Niv-Mizzet Reborn decks plenty in my upcoming multiplayer games. I can't wait to see how you all build them! When we made the original Niv-Mizzet all those years ago, I mentioned how people tried playing him regardless of whether it was correct to do so because of how much fun it was. And all these years later, I think we've hit on something similar: no matter how strong Niv-Mizzet ends up being, I wouldn't be surprised to see people try him in competitive Standard and Modern. He's just too fun! One thing at a time. Let's see how this one does first. It should lead to plenty of wild stories! I hope you all are enjoying War of the Spark previews! Have any feedback? Please send it my way! You can hit me up on Twitter, Tumblr, Instagram, or just by good ol' fashioned email. Let me know what you think!